Another day, another teaser. Just show us the bikes already! The latest video to grace our screens comes courtesy of Taiwanese manufacturer Kymco, who will be unveiling two new scooters at the upcoming Milan Show on November 7. 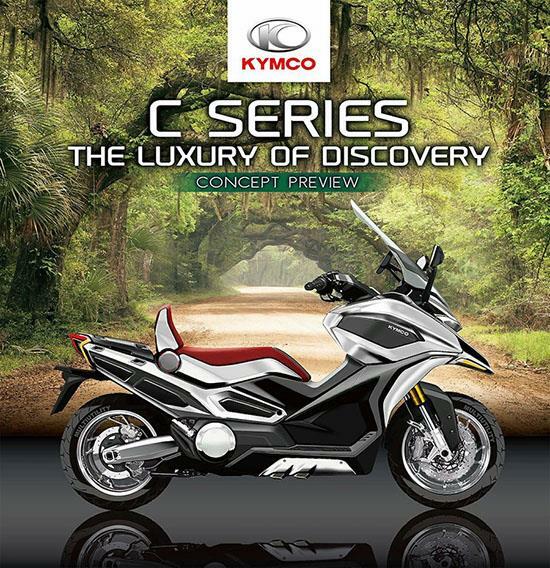 One of the new scoots will be the C Series Concept, which Kymco released a picture of very recently, and takes more than a bit of inspiration from the Honda X-ADV. Despite this, Kymco reckon the model will pioneer a new class of scooter: adventure tourer. From the previous image released of the bike it looks much more road-focused than the X-ADV, with a huge windscreen and road tyres. It features a nifty looking back rest as well, which appears to be adjustable. The concept is based on the AK550 scooter, which is powered by a 550cc parallel twin engine which produces a claimed 53bhp. As is standard with teaser videos no information on the second model is revealed. From the very brief glimpse we get of the second it looks much sportier than the C Series Concept, with low, sleek headlights reminiscent of a Ducati Panigale.